Historically, when looking at the benefits of Lithium-Ion batteries versus VRLA Batteries, Lithium-Ion batteries have been considered too expensive and not safe enough for use in enterprise UPS applications despite their smaller size and longer life span. However, recent innovations in the manufacturing of Lithium-Ion batteries for UPS have made them less expensive and reduced the risk of thermal runaway to virtually impossible. The lower costs and enhanced safety features make Lithium-Ion batteries a practical choice for some large enterprise 3-Phase UPS applications, especially when considering the total cost of ownership of a UPS system. Longer life expectancy – In theory, VRLA batteries used in UPS systems have a life expectancy of about 7 years. But, with real world conditions, most customers need to replace them after only 3-5 years. Lithium-ion batteries have a 15 year design life. Lithium-ion technology can double or triple battery service life, reducing the risks of downtime or load interruption during maintenance or replacement. Lithium-Ion batteries also offer up to 10X the cycle life of VRLA batteries. More power in less space – Lithium-ion batteries provide multiple times the energy and power density compared to VRLA. As a result, UPSs built with Li-ion batteries take up only about one-third the space of a VRLA-based solution that delivers the same power. In general, a lithium-ion battery system for a UPS will take up 50-80% less floor space and weigh 60-80% less than a comparable lead-acid battery system. More forgiving in a wide range of temps – Li-ion batteries can withstand a wider temperature range than VRLA batteries. The rule of thumb is that VRLA battery life is reduced by half for every 10°C (18°F) increase above 25°C (77° F) ambient temperature. Li-ion batteries are far less sensitive to temperature fluctuations and can accept spikes in temperature with almost no effect on battery life. Reduced cooling requirements and costs – The smaller footprint and wider temp range of lithium ion batteries can reduce the space needed in a battery room and increase the optimal operating temperature range. This is good for the health of your other IT equipment, which functions better at more moderate temperatures than VRLA batteries prefer. And Li-ion battery’s ability to maintain a longer life at higher temps allows you to save on cooling costs. Less weight – Lithium-ion batteries offer at least a two-thirds reduction in weight. That means customers have more flexibility in terms of where they install the systems and can often avoid costly building modifications. Battery monitoring systems included – Li-ion batteries come with sophisticated battery monitoring systems (BMS) that provide a clear picture of battery runtime and health. In contrast, remote monitoring systems are available for VRLA batteries but rely on chemistry that makes it hard to accurately predict when they’re going to fail. Embedded monitoring in li-ion batteries at the cell, module, and cabinet level provides a clear picture of battery health. Too Expensive – While, the initial cost for Li-ion batteries can be about two to three times more for the same amount of energy, Li-Ion batteries come with a battery management system and have a longer lifespan. The initial increased cost is offset by the need for fewer battery replacements over time, leaving Li-Ion batteries with a lower total cost of ownership than their VRLA counterparts. Strict Transportation Regulations – Various regulations exist regarding shipping and handling for any kind of battery including Li-ion or VRLA. These shipping regulations tend to be stricter with Li-ion chemistries because of the higher energy densities, but any special handling charges are often offset by the lighter shipping weight of the battery compared to VRLA. Risk of Thermal Runaway – Li-ion batteries have several layers of safety features, such as integrated battery monitoring, built into each battery cell to prevent overheating. Each battery cell within the battery module is designed to shut down in the unlikely event that high temperature thresholds are reached. The battery management system allows the rest of the string to stay online while isolating the bad cell. In addition, advances in battery chemistries have made carbon-less options available that virtually eliminate any risk of thermal runaway. 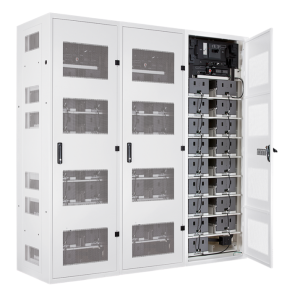 Lithium-ion batteries offer many benefits as the backup power for your large, three-phase UPS system. 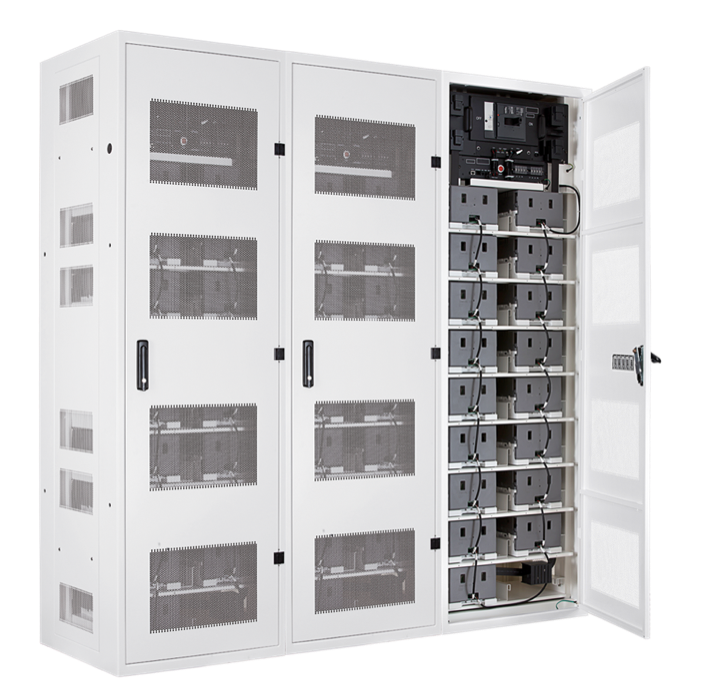 Most manufacturers now offer Li-Ion battery options, with more sizes and ranges coming on the market every month, and all are worth considering when choosing a new UPS system. In some cases these models can also be retrofitted to use Li-ion batteries. For more information on Li-Ion options from APC by Schneider Electric, see Gutor PXC, MGE Galaxy VM and Galaxy VX, Symmetra MW. For more information on Li-Ion options from Eaton, see Eaton 5P, Eaton 9395 and Eaton 93PM. For more information on Li-Ion options from Toshiba, see Toshiba G9000. For more information on Li-Ion options from Vertiv/Liebert, see Liebert EXM. Can my three phase UPS be retrofitted to use Lithium-ion batteries? A: Some models of UPS can be retrofitted to use Li-ion batteries. Because Lithium-ion batteries have such a long life in UPS applications, they may outlive your existing UPS. When that happens you can change out the UPS only and continue to use the same bank of Li-ion batteries. What is the life expectancy of Lithium-Ion Batteries? A: Lithium-ion batteries have a 15 year design life which is double or triple the battery service life of VRLA. Fewer battery replacements reduce the risk of downtime or load interruption during maintenance. Lithium-Ion batteries also offer up to 10X the cycle life of VRLA batteries and come with cell-level battery monitoring systems that provide a clear picture of battery runtime and health. Why is the smaller size of Li-ion Batteries important? A: Lithium-ion batteries provide multiple times the energy and power density compared to VRLA and only take up only about one-third the space. In general, a lithium-ion battery system for a UPS will take up 50-80% less floor space and weigh 60-80% less than a comparable lead-acid system. The smaller footprint and wider temp range of lithium ion batteries can reduce the space needed in a battery room and increase the optimal operating temperature range allowing you to save on cooling costs by keeping the temp a bit higher and cooling a smaller area. What are the temperature requirements for Li-ion batteries? A: Li-ion batteries are far less sensitive to temperature fluctuations and can accept spikes in temperature with almost no effect on battery life. Both lead acid and lithium-ion batteries will see a degradation in cycle life as the temperature rises. However, in general, li-ion service life is less affected by higher temperatures than lead acid. Many of the li-ion batteries being used in UPSs are designed for higher average temperatures (e.g., 40°C/104°F) and can reach the specified service life at those higher temperatures. What is the cycle life of lithium-ion batteries? A: For a traditional sealed lead-acid battery, the cycle life is between 200 and 400 cycles. A typical Lithium-ion battery used for UPS applications can survive for more than 1000 cycles. How does the recharge time compare to lead acid batteries? A: In most cases, the time to reach an 80% state of charge is the same for both VRLA and Li-ion. The lithium battery has a slightly better charge efficiency, so it will reach that level slightly sooner. But to go from 80% to 100% state of charge, the lithium-ion battery is far better. A li-ion battery will reach a 100% SOC in 30 minutes to an hour. A: Lithium-ion batteries have very low maintenance requirements. Their long life span of 10 or more years reduces the need to have to replace them over the course of the UPS’s period of use. By the time the batteries need replaced, it is likely time to replace the UPS as well. The included battery management system automatically collects and reports all the required data to accurately understand the battery system’s health and status which further reduces maintenance burdens. A: Yes, they are recyclable. And there are many recyclers who will take smaller lithium-ion batteries. Some do end up shredded and in a landfill. Research is on-going to improve the recycling economics and governments are beginning to encourage, incent, or outright require the collection and proper recycling of the batteries. Are lithium-ion batteries a safety hazard? A: All battery types, if mishandled (e.g., thrown in a fire) or overcharged have the potential for being a hazard by releasing hazardous materials or igniting a fire. Lithium-ion batteries have been thought to be more volatile due to reported cases of fire and due to their much higher specific energy combined with a greater sensitivity to being over charged. Today’s Lithium-ion battery options have safety features that make it nearly impossible for the battery to approach thermal runaway. Lithium-ion batteries offer many benefits as the backup power for your three-phase UPS system. In some cases these models can be retrofitted to use Li-ion batteries.